I am assistant professor in digital humanities and information sciences at the University of Groningen. Previously I was a postdoc at Heinrich Heine Universität Düsseldorf in the Beyond CFG project, and a PhD candidate in the project The Riddle of Literary Quality. My primary interests are applying computational models to the analysis of literary novels and statistical parsing. Profiles: Google Scholar; Semantic Scholar. PhD in Computational Linguistics (2016), University of Amsterdam. PhD thesis: Rich statistical parsing and literary language (revised version; errata). MSc. in Logic (2011), University of Amsterdam. MSc. thesis: Discontinuous Data-Oriented Parsing through Mild Context-Sensitivity. (code). BSc. in Artificial Intelligence (2009), University of Amsterdam. BSc. thesis: Simulating Language Games in the Two Word Stage. Andreas van Cranenburgh, Karina van Dalen-Oskam, Joris van Zundert (2019). Vector space explorations of literary language. Language Resources & Evaluation. 26pp. Tatiana Bladier, Andreas van Cranenburgh, Kilian Evang, Laura Kallmeyer, Robin Möllemann, Rainer Osswald (2018). RRGbank: a Role and Reference Grammar Corpus of Syntactic Structures Extracted from the Penn Treebank. Proceedings of Treebanks and Linguistic Theories, pp. 5-16. Cliche expressions in literary and genre novels. Active DOP: A constituency treebank annotation tool with online learning. Proceedings of COLING 2018 demonstrations track. Tatiana Bladier, Andreas van Cranenburgh, Younes Samih, Laura Kallmeyer (2018). German and French Neural Supertagging Experiments for LTAG Parsing. ACL 2018 student research workshop. Corina Koolen, Andreas van Cranenburgh (2018). Blue eyes and porcelain cheeks: Computational extraction of physical descriptions from Dutch chick lit and literary novels. Digital Scholarship in the Humanities, vol. 33, no. 1, pp. 59–71. Corina Koolen, Andreas van Cranenburgh (2017). These are not the Stereotypes You are Looking For: Bias and Fairness in Authorial Gender Attribution. Proceedings of the First Ethics in NLP workshop, pp. 12-22. Andreas van Cranenburgh, Rens Bod (2017). 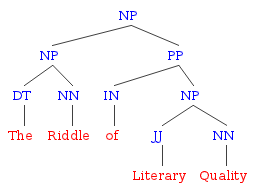 A Data-Oriented Model of Literary Language. Proceedings of EACL, pp. 1228-1238. Micheal Strube: Your model fails to characterize art! The research question mentions the goal of finding textual conventions, but literature is the polar opposite of that. What about e.g., Beckett? Characterizing capital-A Art was not the goal; the goal was merely to empirically characterize the notion of literature that readers have. Yes, it can be argued that literature inherently breaks conventions, especially over longer periods when new styles develop (but this work is on contemporary novels from a 5-year period, so this diachronic perspective is beyond the scope of this work). However, at the same time the "literary novel" can be said to form a genre with its own conventions, and the results of the paper agree with that hypothesis. Either way, concepts can be defined both through differences and commonalities w.r.t. non-members and members, respectively; in order for a predictive model to generalize, finding commonalities is a natural goal and arguably inherent to doing science. It would also be possible to charactize literature by its differences w.r.t. a suitably chosen, large corpus of "conventional" language; this would be an interesting study for future work. Walter Daelemans: You showed that the ratings of highly literary novels have smaller confidence intervals. Could this be because these novels were more prominently covered in the media? All of these novels were popular, by virtue of the corpus selection: being bestsellers or most borrowed from libraries. Note that the novel rated least literary in the corpus, Fifty shades of Grey, probably received the most media attention. An intuitive explanation for the smaller confidence intervals for the novels rated as more literary is that, in general, prototypical members of a concept are easy to agree on, while degrees of less prototypical members (e.g., suspense novels) are more difficult to agree on. What is the effect of author gender? The corpus is approximately balanced in terms of number of novels by men versus women; however, in terms of literary ratings the distribution is not balanced. All of the chick lit novels are by women, while the highly rated novels by Dutch authors are predominantly by male authors. This is a bias of the dataset. For more details on the relationship of author gender and style, see the paper that I co-authored in the Ethics in NLP workshop. Does syntax perform poorly compared to bag-of-words features? The syntactic features only gave a modest improvement when added to the basic and lexical features. This means that there is a large overlap with the word bigrams, but each on its own show comparable performance. However, aside from the scores, in terms of interpretation the syntactic features are still more useful than bag-of-words features. Andreas van Cranenburgh, Remko Scha, Rens Bod (2016). Data-Oriented Parsing with Discontinuous Constituents and Function Tags. Journal of Language Modelling, vol. 4, no. 1, pp. 57-111. Kim Jautze, Andreas van Cranenburgh, Corina Koolen (2016). Digital Humanities 2016, Krakow, Poland, 11-16 July. Machine Learning Literature using Textual Features. Tiny Transactions on Computer Science, vol. 4. Andreas van Cranenburgh, Corina Koolen (2015). Identifying Literary Novels with Bigrams. Proceedings of the Fourth Workshop on Computational Linguistics for Literature, pp. 58-67. Federico Sangati, Andreas van Cranenburgh (2015). Multiword Expression Identification with Recurring Tree Fragments and Association Measures. Proceedings of the 11th Workshop on Multiword Expressions, pp. 10-18. Extraction of Phrase-Structure Fragments with a Linear Average Time Tree Kernel. Computational Linguistics in the Netherlands Journal, vol. 4, pp. 3-16. Dirk Roorda, Gino Kalkman, Martijn Naaijer, Andreas van Cranenburgh (2014). LAF-Fabric: a data analysis tool for Linguistic Annotation Framework with an application to the Hebrew Bible. Computational Linguistics in the Netherlands Journal, vol. 4, pp. 105-120. Andreas van Cranenburgh, Rens Bod (2013). Discontinuous Parsing with an Efficient and Accurate DOP Model. Proceedings of the International Conference on Parsing Technologies, Nara, Japan, 27-29 November. The treebank splits for Lassy and Tiger where made using these scripts. This paper claims that the coarse-to-fine pruning method for PLCFRS with PCFG-approximations is slow on longer sentences. This does not hold for the grammars used in this paper, and probably relates to anomalies with the treebank with which this issue was observed. Kim Jautze, Corina Koolen, Andreas van Cranenburgh, Hayco de Jong (2013). From high heels to weed attics: a syntactic investigation of chick lit and literature. Proceedings of the Computational Linguistics for Literature workshop, Atlanta, Georgia, June 14. Proceedings of the Computational Linguistics for Literature workshop, pp. 59-63.
http://aclweb.org/anthology/W12-2508 (code, slides, revised paper—includes results on Federalist papers). Efficient parsing with linear context-free rewriting systems. Proceedings of the 13th Conference of the European Chapter of the Association for Computational Linguistics (EACL), Avignon, France, April 23–27. http://aclweb.org/anthology/E12-1047 (poster, errata, corrected version, code). sec 3.3: mention COLLINS.prm as model for evaluation parameters. sec 3.3: highest parsing complexity for non-optimal markovized grammar is 9, not 15 (the latter was the result before the improved punctuation heuristics had been applied). sec 4: actually, two values for k were used; k=10,000 in the first stage when parsing the PCFG approximation and the actual LCFRS; later when parsing with the DOP grammar, k=50 is used, as in my previous paper on discontinuous DOP. This choice was dictated by efficiency concerns, due to the size of the DOP grammar, a lower value is necessary for it. sec 5: additional result in table 3: comparison of up to 30 words with old evaluation parameters. sec 5: additional result in table 4: CFG-CTF with up to 25 words. Clearly, the result is better than the PCFG approximation alone, but not as good as the real LCFRS; perhaps it can be conjectured that the result will necessarily be within the interval of the two. While the title of the paper refers to Linear Context-Free Rewriting Systems, the paper only deals with string rewriting LCFRSs for discontinuous parsing. However, the approach is more general than that; e.g., as the work of Barthelemy et al. shows, the technique works for Tree-Adjoining Grammars as well. Acknowledgements: Some of these changes were prompted by feedback from David Weir, Alexander Koller, and Carlos Gómez-Rodríguez. Maria Aloni, Andreas van Cranenburgh, Raquel Fernández, Marta Sznajder (2012). Building a Corpus of Indefinite Uses Annotated with Fine-grained Semantic Functions. The eighth international conference on Language Resources and Evaluation (LREC), Istanbul, Turkey, May 23–25. Andreas van Cranenburgh, Remko Scha, Federico Sangati (2011). Discontinuous Data-Oriented Parsing: A mildly context-sensitive all-fragments grammar. Proceedings of the 2nd Workshop on Statistical Parsing of Morphologically-Rich Languages (SPMRL), pages 34–44, Dublin, Ireland, October 6.
http://aclweb.org/anthology/W11-3805 (slides, template for slides, code). Andreas van Cranenburgh, Galit Sassoon, Raquel Fernández (2010). Invented antonyms: Esperanto as a semantic lab. Proceedings of the 26th Annual Meeting of the Israel Association for Theoretical Linguistics (IATL 26). Dependency Parsing BSc/MSc course 2017, Heinrich Heine University. Together with Simon Petitjean. Digital Humanities BA Hons. course 2015, University of Amsterdam. Together with Corina Koolen. Dutch weak and strong pronouns as a stylistic marker of literariness. Digital Stylistics in Romance Studies and Beyond conference. February 27th, 2019. Wuerzburg (slides). A DOP Active Learning Prototype. Grammars, Computation & Cognition workshop, SMART Cognitive Science conference. December 6, 2017 (slides). Markers of Literary Language. ILLC Midwinter Colloquium. January 15, 2016 (slides). Revisiting competence & performance. Workshop 25 years of Data-Oriented Parsing. June 30, 2015 (slides). An efficient and linguistically rich statistical parser. Invited lecture at University of Gothenburg, April 16, 2015 (slides). Text Mining and Stylometry. Invited lecture at DH crash course, Amsterdam, October 23, 2014 (slides, ipython notebook). Data-Oriented Parsing and Discontinuous Constituents. Guest lecture in Unsupervised Language Learning course, University of Amsterdam, March 4, 2014. (slides). Linear average time extraction of phrase-structure fragments. Presented at the 24th Computational Linguistics in the Netherlands (CLIN) conference, Leiden, January 17, 2014 (slides). Estimating literary readability through lexical & syntactic complexity. Workshop Complexity in Digital Humanities, Meertens, Amsterdam, November 7th, 2013 (slides). Discontinuous Data-Oriented Parsing using Coarse-to-Fine methods. Invited talk, University of Düsseldorf, November 29th, 2012. (slides). Reviewer ACL 2013, EMNLP 2014, NAACL 2018, 2019, etc.